Ayers and his wife, Bernardine Dohrn, were the main founders of the domestic terror group the Weather Underground, which was assigned responsibility for dozens of bombings aimed at destroying the defense and security infrastructure of the U.S.
D’Souza is the maker of the movie “2016: Obama’s America,” which is the second-highest grossing political documentary of all time. It blasts Obama’s policies and actions, and warns America about what the nation would be under Obama’s vision for the United States. In a 2001 interview with the New York Times, Ayers said, “I don’t regret setting bombs. I feel we didn’t do enough.” Accompanying the article was a photograph of him stepping on an American flag. Ayers also questioned ramifications for behavior Americans long have considered expected. “If you are a felon, why do you get disqualified as a citizen and get denied your right to vote? Just because you’ve committed a crime?” he asked D’Souza. D’Souza focused on another subject. “What is happening to the American dream?” he asked. “We [in the U.S.] are losing the secret of the American dream, but it is coming alive in countries like China, India and Brazil where the people have learned the secrets of wealth creation – making stuff other people really want to buy, and in the process [they are] taking over the global market. Global capitalism has been the greatest gift of America to the world. Social agitation has failed to deliver the goods,” he said. Ayers asked the audience if members opposed slavery. Getting an anticipated, “Yes,” Ayers argued a Howard Zinn theory of U.S. history insisting the Dartmouth audience would have been forced to oppose the Founding Fathers on the question of slavery – ignoring the history of the United States righting racial injustice since Abraham Lincoln and the Emancipation Proclamation. D’Souza countered Ayers on slavery by referring to Lincoln and arguing that starting with the Civil War, the history of the United States is a history of fighting to end slavery and establish racial equality. The two then argued over the Holocaust, the question of the Gulf War and why no weapons of mass destruction were found when George H.W. Bush invaded Iraq and deposed Saddam Hussein. “I believe in the United States we are all a minority of one and we are each entitled to the full rights made available to us in the Bill of Rights,” D’Souza said. D’Souza got strong applause countering Ayers. 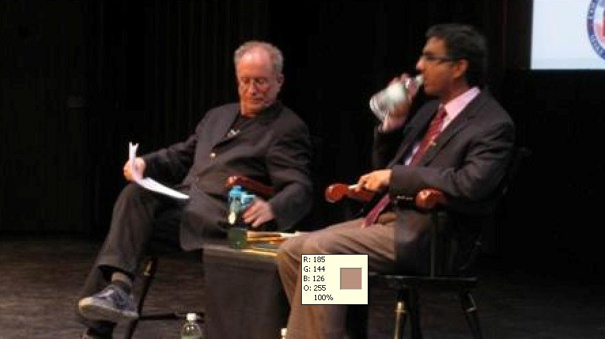 “I submit that if you were a professor here before the tenure committee, the defender of queer theory would have every reason to expect to be promoted, while the evangelical Christian would have to hide his true views,” D’Souza challenged. His appearance has been overshadowed by the recent accusation from authorities that he donated more than the legal requirement to the 2006 campaign of Republican Wendy Long, who lost the race for the U.S. Senate seat in New York that had been vacated by Hillary Clinton. The indictment charges D’Souza donated $20,000 to Long’s campaign by aggregating the money from various people and falsely reporting the source of the funds. As WND reported, many of D’Souza’s defenders see the indictment as the administration exacting revenge over D’Souza’s film.